When Trailblazers was first announced by developer, Supergonk, it was marketed as F-Zero meets Splatoon. Considering I thoroughly enjoy both franchises, I was immediately interested. 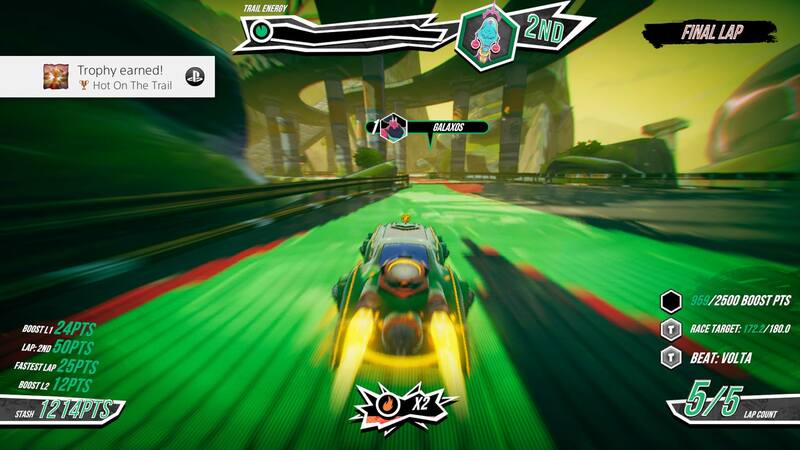 Trailblazers is vibrant with color and soars with pulse-pounding music perfect for high-speed racing. Unfortunately, the game struggles to reach top speed. It’s always odd, to me, when a racing game has a story mode. I’ve never found them to be all that great, especially looking at F-Zero GX’s. The purpose of the story mode in Trailblazers is, primarily, to get you introduced to the different racers and how their vehicles handle. The writing oscillates between Borderlands humor and cringe-worthy jokes that unfortunately fall flat. To speak specifically about the career mode and where it meets gameplay for a moment, I’m not sure why the career mode exists in the way it does. In normal racing games, you would race 3 laps for a spot in the top 3. But in Trailblazers’ career mode, you’re chasing after specific objectives. Achieve just one objective and you pass the race. That’s it. There’s no incentive to get better at the actual racing. In Career, the game actively teaches you to just aim for the easiest objective over becoming a better racer. Some of the objectives can be downright unforgiving as well. I’ll talk about the reverb effect from the walls later but some objectives require you to earn a set amount of points, without ever really explaining how to do so. Let’s go ahead and talk about the gameplay. 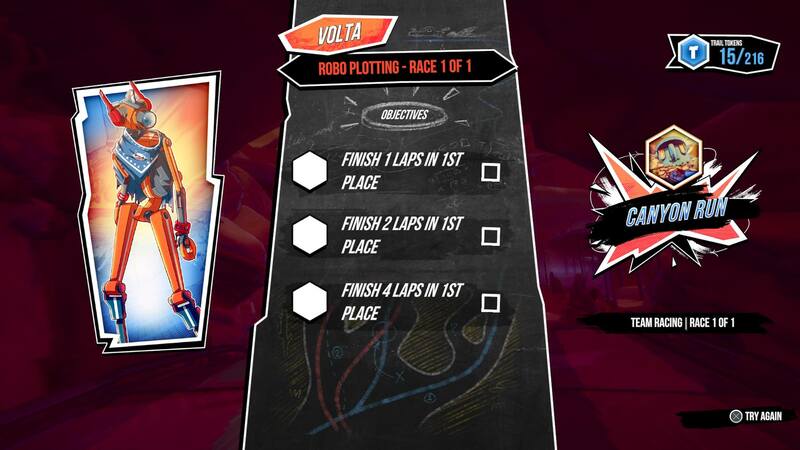 Trailblazers’ racing component is straight-forward enough but it spices things up with the ability to paint the track. As you paint the track, you create boost strips that then allow you, and members of your team, to boost through the track. It’s a fascinating mechanic that requires key timing because, if used incorrectly, it can hurt your team also. There’d be instances where the computer AI on my team would paint the track coming out of a turn, which would send my car hurtling into a wall. While at the same time, your paint can be used to fly in front of you and stun an opponent, or break off their boost trail. Honestly, the strategies that can be implemented with the paint trails is fantastic. Unfortunately, the game is not as polished as it needs to be. If you hit, or even graze, a wall while racing, your car is knocked back as if the wall punched you back. There were several tracks where I would graze a wall, or hit one with the side of my car, and I’d proceed to ping-pong between two walls thus hindering my progress. There are some tracks that are designed in such a way that, to me, it was impossible not to hit several bumpers and walls during a long turn. In a racing game, it’s all about maintaining momentum. But when a game has this kind of wall-checking problem that completely halts the momentum, it’s incredibly jarring and applies the brakes to the fun. In regards to scoring points, you earn points by painting the track, hitting other racers with your paint, maintaining boost, to name a few. But outside of some Career mode races, the points don’t ever seem to amount to much which left me questioning their existence in the game. Why did the game have me chase after points in Career mode, if they weren’t worth anything in the races outside of Career? In a game like Splatoon 2, you have a clear objective: paint as much of the map as possible. It’s a fun and stress-free type of multiplayer experience. So when you see you’re racking up points by painting the track in Trailblazers, you’d think that it would somehow contribute later on. 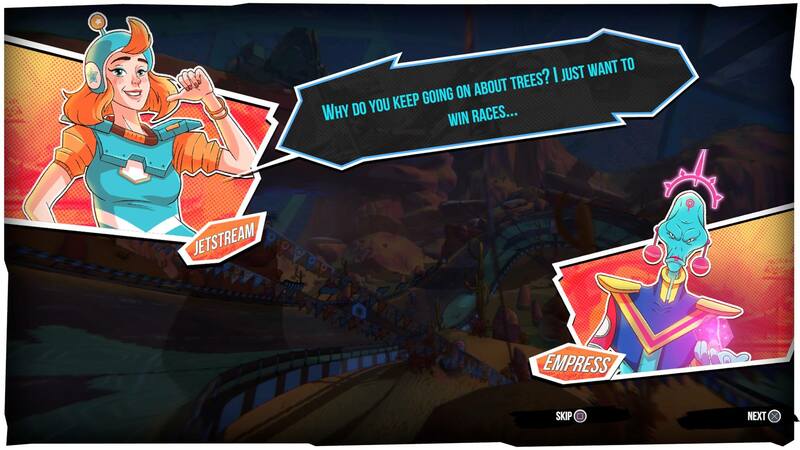 And while you do earn a final score at the end of the race, it doesn’t really serve any purpose. As is, the game comes across as struggling with an identity-crisis of which kind of game it wanted to commit to; fun, carefree multiplayer or intense racer. This makes it difficult to gauge if you’re actually good at the game or not. You may come in last place and have the highest points because of how much you painted the track, but does that equate to you being good at the game? Or terrible? Which objective the game wanted me to go for was never really clear. Because of this lack of direction, the gameplay experience suffers. Between that and the nasty reverb effect from hitting walls and other racers, I found myself so frustrated during the majority of my time with Trailblazers that I honestly closed the game to play something else several times. While Trailblazers does feature online modes to race head-to-head with other players (including cross-platform with PC players), I could not get into a match to give it a go. Either not many folks are playing online or I ran into server issues when I attempted to play. This can be seen in the Preview video on our YouTube channel that’s linked below. Trailblazers is a game that, on paper, sounds amazing! I wanted to enjoy this game and had hoped I had a new racing game on my hands that I would be able to champion. Instead, I’m left with a game that lacks polish and is simply not fun to play. Hopefully Supergonk will fix the wall-bounce and tweak the points system for painting the track. With the state of Trailblazers as is, I cannot recommend spending $29.99 on this game. To get a better idea of Trailblazers in action, check out our TRG Preview on YouTube.